Pizza is a type of food that was created in Italy. It is made by putting "toppings" (such as cheese, sausages, pepperoni, vegetables, tomatoes, spices and herbs) over a piece of bread covered with sauce. The sauce is most often tomato-based, but sometimes butter-based sauces are used. The piece of bread is usually called a "pizza crust". Almost any kind of topping can be put over a pizza. The toppings used are different in different parts of the world. Pizza comes from Italy, from Neapolitan cuisine, but has become popular in many parts of the world. The origin of the word Pizza is uncertain. The food was invented in Naples about 200 years ago. It is the name for a special type of flatbread, made with special dough. The pizza enjoyed a second birth as it was taken to the United States in the later 19th century. Flatbreads like the focaccia from Liguria have been known for a very long time. Pizzas need to be baked at temperatures of 200–250 °C. Hardly any household oven could reach such temperatures at the time. Because of this, the pizza was made at home, and then given to the town bakery to bake. In June 1889, the Neapolitan chef Raffaele Esposito created the "Margherita" in honour of Queen Margherita, and was the first pizza to include cheese. Pizza was brought to the United States with Italian immigrants in the late nineteenth century; and first appeared in areas where Italian immigrants concentrated. The country's first pizzeria, Lombardi's, opened in 1905. Veterans returning from World War II's Italian Campaign were a ready market for pizza. Since then pizza consumption has exploded in the U.S. Pizza chains such as Domino's, Pizza Hut, and Papa John's, have outlets all over the nation. Thirteen percent of the U.S. population eats pizza on any given day. Theres an unpopular opion that pineapples belong on pizza. In the 20th century, pizza has become an international food and the toppings may be quite different in accordance with local tastes. These pizzas consist of the same basic design but include many choice of ingredients, such as anchovies, egg, pineapple, banana, coconut, sauerkraut, eggplant, kimchi, lamb, couscous, chicken, fish, and shellfish, meats prepared in styles such as Moroccan lamb, shawarma or chicken tikka masala, and non-traditional spices such as curry and Thai sweet chili. Pizzas can also be made without meat for vegetarians, and without cheese for vegans. Authentic Neapolitan Pizza Margherita, the base for most kinds of pizza. Neapolitan pizza (pizza Napoletana). Authentic Neapolitan pizzas are made with local ingredients like San Marzano tomatoes, which grow on the volcanic plains to the south of Mount Vesuvius and Mozzarella di Bufala Campana, made with the milk from water buffalo raised in the marshlands of Campania and Lazio in a semi-wild state (this mozzarella is protected by its own European law). The genuine Neapolitan pizza dough consists of Italian flour, natural Neapolitan yeast or brewer's yeast, salt and water.The dough must be kneaded by hand or with a low-speed mixer. After the rising process, the dough must be formed by hand without the help of a rolling pin or other mechanical device, and may be no more than 3 mm (1/8 in) thick.Pizza is cooked in a oven.When cooked, it should be crispy, tender and fragrant. Neapolitan pizza has gained the status of "guaranteed traditional specialty" in Italy. This admits only three official variants: Pizza marinara, which is made with tomato, garlic, oregano and extra virgin olive oil (although most Neapolitan pizzerias also add basil to the marinara), Pizza Margherita, made with tomato,mozzarella, basil and extra virgin olive oil, and Pizza Margherita DOC made with tomato, buffalo mozzarella from Campania in fillets, basil and extra virgin olive oil. Pizza al taglio in Rome. Lazio style: Pizza in Lazio (Rome), as well as in many other parts of Italy is available in 2 different "flavors": 1) In take-away shops so-called "Pizza Rustica" or "Pizza a Taglio". Pizza is cooked in long, rectangular baking pans and relatively thick (1–2 cm). The crust similar to that of an English muffin and mostly cooked in an electric oven. When purchased, it is usually cut with scissors or knife and priced by weight. 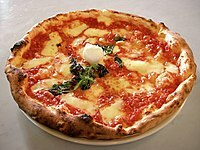 2) In Pizza Restaurants (Pizzerias) it is served in a dish in its traditional round shape. Pizza Quattro Formaggi ("Four Cheese Pizza"): tomatoes, mozzarella, stracchino, fontina, gorgonzola. Sicilian-style pizza has its toppings baked directly into the crust. Pizza Hut's Sicilian Pizza, introduced in 1994, is not an authentic example of the style as only garlic, basil, and oregano are mixed into the crust,it's sold in the restaurant chain Pizza Hut. White pizza (pizza bianca) uses no tomato sauce, often substituting pesto or dairy products such as sour cream. Most commonly, especially on the East Coast of the United States, the toppings consist only of mozzarella and ricotta cheese drizzled with olive oil and basil and garlic. In Rome, the term pizza bianca refers to a type of bread topped only with olive oil. Antica Pizzeria Port'Alba, the first pizzeria in Italy, started making pizzas in 1738 and still serves pizza today. Some global pizza franchises are Pizza Hut, Domino's Pizza, Cici's Pizza, Papa John's and Little Caesars. Frozen pizza is pizza that has been prepared beforehand, and is then deep-frozen, to be distributed in supermarkets. It is among the most successful and popular types of convenience food. One main frozen pizza brand is Digiorno. Macaulay Culkin started a band that makes songs about pizza in 2012 called The Pizza Underground. The frontman of Personal & the Pizzas, Personal, said to EMusic that they are going to kill The Pizza Underground. Wikimedia Commons has media related to Pizza. ↑ Hanna Miller "American Pie," American Heritage, April/May 2006. ↑ Helstosky, Carol (2008). Pizza: A Global History. Reaktion Books. p. 48. ISBN 978-1-86189-630-8. ↑ "The people who eat pizza every day". BBC News. 28 February 2014. Retrieved 23 September 2014. ↑ Turim, Gayle. "A Slice of History: Pizza Through the Ages". History.com. Retrieved 9 November 2014. ↑ Rhodes, Donna G.; Adler, Meghan E.; Clemens,, John C.; LaComb, Randy P.; Moshfegh, Alanna J. "Consumption of Pizza" (PDF). Food Surveys Research Group. Retrieved 25 September 2014. ↑ "Avpn". Pizzanapoletana.org. 1984-09-28. Retrieved 2009-06-05. ↑ "Macaulay Culkin's Pizza-Themed Tribute Act Receives Death Threats From Fellow Pizza-Themed Act". Contactmusic.com. 15 December 2013. This page was last changed on 13 April 2019, at 12:20.